"We have a candidate without a moral compass, without empathy for its citizens." Since the early days of Donald Trump‘s candidacy, politicians and journalists have channelled attorney Joseph Welch‘s famous question delivered to chief red scaremonger Sen. Joseph R. McCarthy. “Have you no sense of decency?” Welch asked McCarthy during the Army-McCarthy hearings after the Senator alluded, as a diversionary tactic, that one of of Welch’s associates had ties to the Communist party. They were the magic words that broke McCarthy’s opressive spell. In March 2016 it was Rep. John Lewis, in a tweet. Most recently, it was Dan Rather in a Facebook post Friday describing Khizr Khan‘s speech at the DNC. There was also, as there always is, a tweet from the ever-wounded, ever embattled Trump. 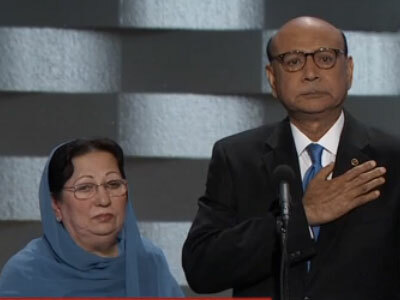 Khan’s wife, Ghazala, responded to Trump’s veiled, suggestive stereotype, explained in The Washington Post why she didn’t speak at the DNC. “Here is my answer to Donald Trump: Because without saying a thing, all the world, all America, felt my pain. I am a Gold Star mother. Whoever saw me felt me in their heart,” she wrote.